India regular captain Virat Kohli returned from Down Under after a long three-month-long tour of Australia, New Zealand. India regular captain Virat Kohli returned from Down Under after a long three-month-long tour of Australia, New Zealand. He was spotted at the airport along with his wife Anushka Sharma. 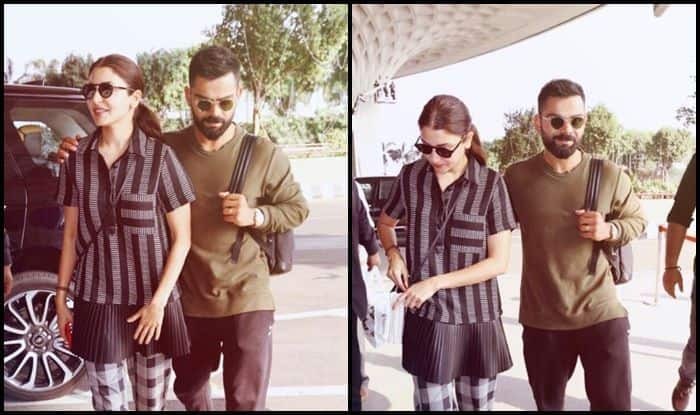 While Kohli was wearing olive green tee teamed with a black track pant and a pair of white shoes, whereas Anushka Sharma was spotted donning a monochromic outfit. And the couple completed the look with a pair of black shades. The scenes are from the Mumbai airport where the couple arrived. Meanwhile, Kohli has had a dream tour of Australia where he led India to history by winning the Test and the ODI series. The regular India captain was not a part of the last leg of the tour in New Zealand as he was rested by the BCCI, following a grueling Australia series. India will soon be hosting Australia in a limited over series, starting February 24. Kohli is expected to be a part of the side as the captain. It is also expected that KL Rahul could return to the side and Rohit Sharma could be rested. The Men in Blue will play a two-match T20I series, which will be followed by a five-match ODIs.